Morales chats with The Advocate about making history as a queer woman of color playing network TV's first bisexual sitcom lead. 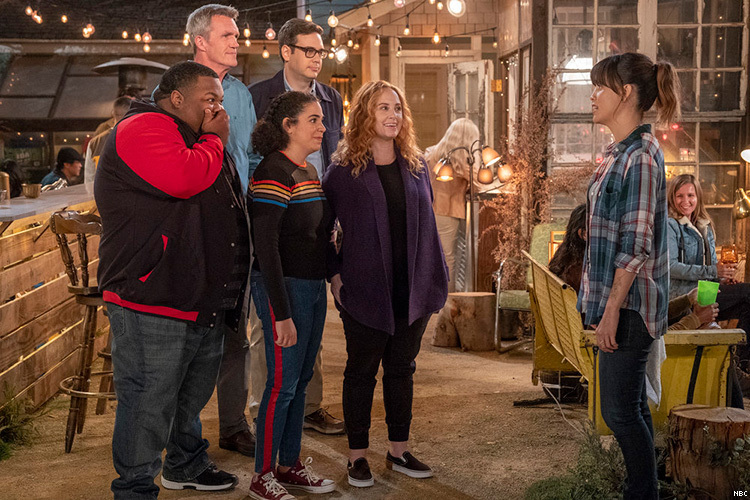 The new NBC comedy Abby’s offers a straight-forward premise that fits perfectly with the multi-cam sitcom format that dominated TV comedies for decades — a no-nonsense former marine opens an unlicensed bar in her backyard where she surrounds herself with a group of loveable patrons who abide by her quirky rules. 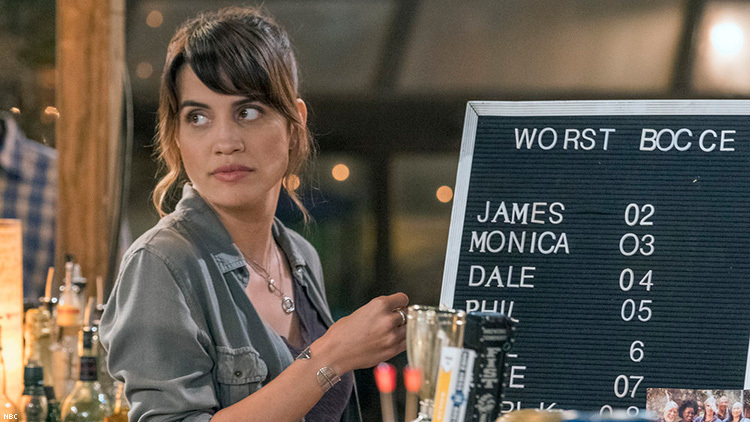 Even as the series bears the familiar audio of being filmed before a live audience and the recognizable shot-reverse-shot camera work prevalent in multi-cam comedies, Abby’s is quietly revolutionary in its casting of Natalie Morales, a queer Cuban woman, to play the titular character, TV’s first bisexual lead in a comedy who is also a woman of color. “It's a huge deal, not only personally, but just that the character is the first bisexual lead of a network show and we meet her ex-girlfriend!” Morales tells The Advocate. “It's not necessarily the main thing but you are showing a woman who dates women and is the lead of a show and it's totally normal. That's what we wanted to perpetuate and talk about is the normalcy of it,” she adds. 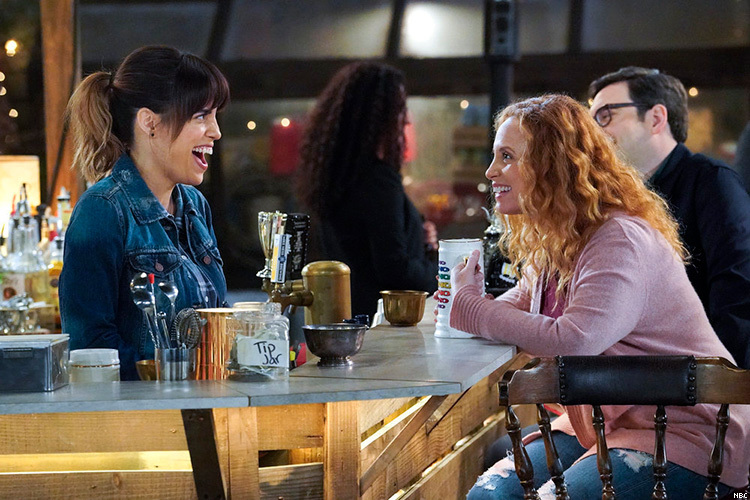 The series never makes a meal of Abby’s sexuality, and it’s probably a lot less interesting than the 162 rules and regulations of her bar that include a no-phones rule and a tiered seating arrangement based on time served at the bar. Still, the reveal that she dates men and women is revelational coming from a lead character of a sitcom whose queerness was known even before the first episode aired. The Good Place’s Eleanor (Kristen Bell) revealed she’s bi in the third season after much innuendo, but her identity wasn’t clear from the start. After 10 seasons of baiting and a recent affair with a woman, Will & Grace had the opportunity to declare Karen (Megan Mullally) bisexual (which would have retroactively made her the first bi character in a comedy ensemble), but the writers chose to have her come out as straight. “It’s a huge deal for me,” Morales says of carrying the mantle of bi visibility, especially since it's also personal. “I never saw that growing up. I never saw anything like that and especially not on network television and especially like an LGBTQ+ character that wasn't in peril and who wasn't going to be killed or their girlfriend was going to die in their arms or whatever,” Morales says. Now 34, Morales cut her teeth in sketch comedy before going on to star in the 90210 reboot, Parks and Recreation, Girls, and Santa Clarita Diet. She had recently wrapped production on Battle of the Sexes (the biopic starring Emma Stone as Billie Jean King who took on Bobby Riggs in the tennis match of the century while also discovering her sexuality) when she came out as queer in an op-ed in June 2017. In the film, Morales played Rosie Casals, a contemporary of King’s who was part of the "Original 9" tennis players who fought for equal pay in sports. “It’s a really remarkable story, especially on the front of being gay in any way, and daring to fight for something publicly,” Morales says of King and the Original 9. But Morales, who says costarring in Battle of the Sexes was, “One of the best moments of my life,” has already emulated that boldness by coming out publicly and blazing a trail for other queer lead sitcom stars to come out and play characters not defined by their sexuality.